Trial versions of the Awasu Advanced and Professional Editions are available if you want to give them a go before purchasing. These are fully-functional versions of Awasu that you will be able to use for a limited amount of time. Just download and run one of the installers below. Find out more about the differences between the two editions here. When you first run Awasu, you will be asked to request a trial key. Please enter the email address you want your trial key to be sent to. When you receive your trial key, just paste it into the second part of the dialog and Awasu will now start. 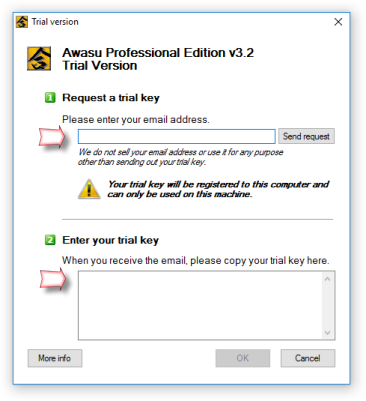 You should not request a trial key until you are ready to start using Awasu! Thanks for giving Awasu a go. You will be able to use Awasu for a period of 28 days, starting from when you request your trial key. You can try out both the Advanced and Professional Editions using the same trial key. Just install them to the same directory when you want to try each one out. When your trial expires, Awasu will continue to work except that channels will no longer update and you will not be able to create any more new channels. At this time, you should either purchase a copy of Awasu or un-install the trial version. Because we are constantly improving Awasu, you can get a new trial key once every six months so that you can check out the latest new features.